How much money will the next Arsenal manager be given to splurge on players? The coach who replaces Arsene Wenger should read the small print on any contract because the newspapers and the trusty BBC are very confused. The BBC says “Arsene Wenger’s successor at Arsenal will be given a £200m transfer budget”. That’s a huge amount of money. Wenger could have bought 5 Granit Xhakas for that. The source for the BBC’s story is the no less trusty Daily Star. It reports the headline figure as an “exclusive” but offers not a single shred of proof to support the story – not even an unnamed “insider” is coughed up to say it’s all true. It’s wrong, of course. We know the £200m figure is wrong because on April 23 the Daily Telegraph said the next Arsenal manger will have a transfer kitty of…£50m. 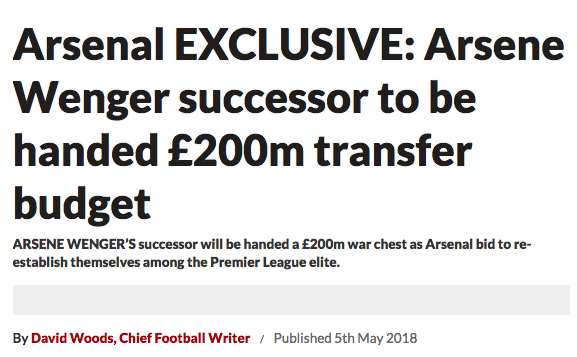 That lower figure sounds more in keeping with Arsenal’s history than the £200m. So how did it come about? 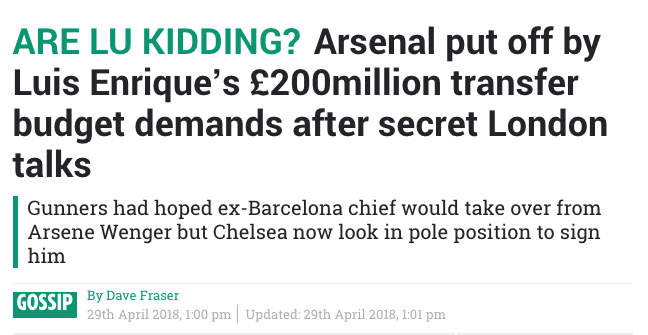 Well, a few days ago, the Sun said former Barcelona manager Luis Enrique wants £200m spending money to take over at Arsenal. But Arsenal don’t have that sum so it’s no deal. Did the Star just see the figure and echo it? Arsenal have stepped away from making Luis Enrique the managerial successor to Arsene Wenger… The Sunday Times understands that senior executives consider Enrique an inappropriate fit to the position. In short: no-one outside the club knows who Arsenal will appoint, let alone what the transfer budget will be.